Have you been told to purchase a CAM Walker by your Health Professional and don’t know where to get one? 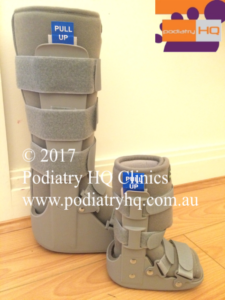 Our Yarraville and South Melbourne Clinics stock brand new CAM Walkers for sale at affordable prices. We stock toddler to adult sizes. Our friendly staff will happily fit your CAM Walker and provide you care instructions at home. To access this service a booking will need to be made. We do offer emergency appointments (same day services) for this service.